Origin - According to the Hindu mythologies, at the age of sixteen, Maa Shailputri was extraordinarily beautiful, charming as was blessed with a very fair complexion. Goddess Mahagauri is the name given to her due to her extremely fair complexion. 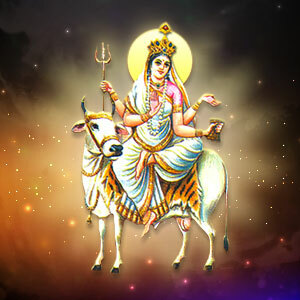 Maa Mahagauri is believed to be the ruler of planet Rahu. Goddess Mahagauri is worshipped on the eighth day of Navratri and is the eight facet of Goddess Durga. She possesses an unfailing power which is believed to be instantly fruitful. It is believed that if one worships her, all their past, present and future sins are wiped off and the devotee get purified in all forms. MahaGauri is said to be peaceful, intelligent and calm. She has a dark complexion due to her long austerities in the rich forests of the Himalayas. She rides a bull, dressed in a white or green saree. She has four arms. She holds a trident in the right arm and the lower right arm in the gesture of blessing. She holds a pellet drum in the lower left arm and another arm is in the gesture of allaying fear. Then after take sankalp for vrat, poojan and do shodhopchar puja of all sthapit gods alongwith Maa Mahagauri. The shodhopchar puja includes avahan, aasan, padya, ardhya, aachman, snan, cloths, saubhagya sootr, sandal, roli, haldi, sindoor, durva, bilvpatr, ornaments, flower garland, perfume, dhoop-deep, naivadya, fruits, betel leaf, dakshina, aarti, pradikshna, mantra pushpanjali etc. Maa Durga should be offered Coconut and it should be given as alms. Maa Mahagauri blesses beauty. Do dhyan on Maa while keeping white flowers in palm. Kanya poojan or worshipping of girls aged between 2 to 10 years is considered very auspicious on this day. The right number of girls for worshipping is 9 but worshipping 2 girls will solve the purpose. Give gifts to the kanyas after they had meals.